As a result of the federal tax cut, Disney promised that its employees would get $1,000 bonuses. Disney offered the bonuses to most of its employees with no conditions. But for 41,000 union members in Orlando, Florida, and Anaheim, California, Disney is requiring them to agree to the company’s contract proposals in order to get the bonus. In December, Disney workers in Orlando rejected the company’s offer of a 50-cent pay raise, far below the livable wage that Disney’s employees are fighting for. A new report shows that the overwhelming majority of Disney employees who responded said they do not earn enough for basic expenses every month. Meanwhile, the tax cut will bring Disney some $2 billion every year. Giving every Disney employee the promised $1,000 bonus would cost Disney $125 million. The report on Disney employees revealed that more than 10% of working people at Disneyland resorts have been homeless or have not had a place to sleep in the past two years. I met [Weiny] in October 2013. Carsland was her home. You could find her in that land working from 11:30 p.m. to 8 a.m., six days a week. She always smiled and greeted you with a “hello.” Restrooms were her major. The first month working with her in restrooms was hard. She had her own ways of doing things, and as soon as I got to know her, I knew what she liked and what she didn’t. She was good at her job and never once did I hear her complain about her job or her pay. Every day she had a pear or apple for lunch and occasionally a muffin. Sometimes she’d buy me lunch and refuse to have me pay her back. So I would secretly pay for her muffins or lunch whenever I saw her walk into the cafe. “No, darling! It’s OK,” was her reply whenever the lunch lady would tell her that her meal was paid for. She would then come to me and thank me but, the next day, would beat me and secretly buy me lunch. She was like that with everyone, not just me. If you had a birthday, she would chip in and help buy you a cake. Because that was the type of person she was. She was a kind person who was loved by everyone…. November 2016: Weiny goes missing right after Thanksgiving weekend. Working for almost five years for this company now, I was used to seeing people come and go. Some went and just never came back. Sometimes you saw it coming and sometimes you just didn’t. I wasn’t ready for her to go, and I never thought I’d see her go. It took about a month for us to find her. It took endless messages, Facebook shares, phone calls and driving around. All it took was a message from her cousin that Wednesday morning in December. “We found Her. She is passed. Thank you for all that you did” was what it read. My heart dropped, and I wanted to just disappear. I felt like what I did wasn’t enough. I felt like I was to blame. Soon enough, I found out more things about my friend, Weiny. I found out she was found in her car in a gym parking lot after suffering a heart attack. She sat in her car for almost a whole month waiting for someone to find her. Why? Because she lived in her car and that gym parking lot was her home. She would use the gym to shower and use the restroom. She didn’t have enough money to get her own place, and my heart broke because all she did was give and give. Never once did she complain. But behind that smile and “good morning, darling” lived a whole different person. A woman struggling and working eight-hour shifts for six days for a company that didn’t even bother helping with flower arrangements. For a company that took and took from her and terminated her on the spot after her third no call, no show. A company that asked for her costumes back as soon as possible so they can give them to the next re-hire. 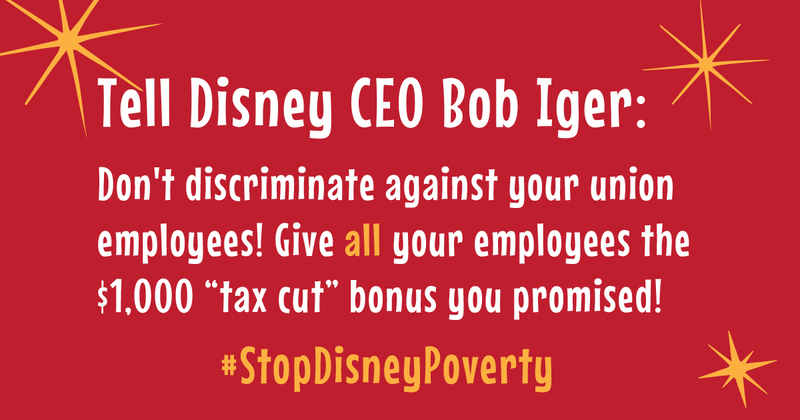 Read the rest of the story and take action today by telling Disney to pay all of its employees the promised $1,000 bonus.